Steve Kinniburgh insists everyone at Kettering Town has “each other’s back” as they try to find a way to turn their season around. The Poppies finally registered their first home win of the season in the Evo-Stik Southern League Premier Division last weekend when they fought back from a goal down to beat Weymouth 3-1 at Latimer Park. But the good feeling didn’t last long as, just three days later, they were back to square one after a 1-0 defeat at Chesham United. 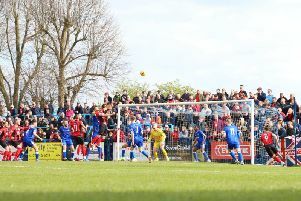 The Poppies’ inconsistent form has left them in mid-table and has seen the pressure grow on manager Marcus Law after the club themselves admitted a push for promotion was the main aim for the season. But first-team coach Kinniburgh insists there are no divisions within the Kettering camp, although he admits the frustration is growing at the lack of results. “Everyone is firmly behind the manager and behind each other, that is not an issue,” Kinniburgh said. “Everybody has got each other’s back and we want to play to win. “The problem we have is that we are coming off the pitch, like we did on Tuesday night, baffled by how we have not been able to get a positive result. “It is becoming more and more frustrating. “Our build-up play has, in general, been very good and I would say that in the majority of games we have played this season, we have been the better team on the day. “But, more often or not, we have not been coming out with the results we want. “There’s obviously a reason behind that and we have to look into that. “On paper, we have a fantastic squad but we aren’t punishing teams often enough and then, when we make silly mistakes, our opponents are taking advantage of it. The Poppies are now preparing for a switch of focus as they host Evo-Stik Northern Premier League Division One South side Market Drayton Town in the first qualifying round of the Buildbase FA Trophy this weekend. And Kinniburgh believes the lack of clean sheets Kettering have been keeping of late is an issue that they “need to address”. “It’s not just the finishing that is the problem,” he added. “We did have a couple of chances on Tuesday night but we are unable to kill teams off in the final third at the moment. “But if we look back at the last few games, we are not keeping clean sheets.